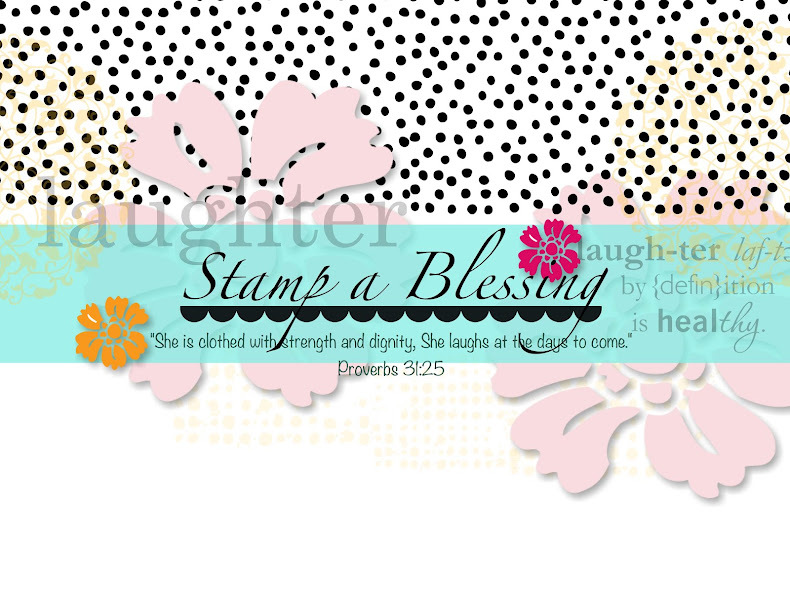 One of the most beautiful blessings I have with Stampin'Up! is meeting amazing crafters that LOVE the art of stamping and love people. One of these remarkable women in my life is Creative Donna, as I lovingly call her. She has been an inspiration for years since we met in StampinConnection (the demo's website) and we have seen and embrace each other several times. I invited her today to share her talent and ideas with you. I am so delighted to have been invited by Jessica to be an occasional guest designer to her blog (she's a gem, isn't she?!)! 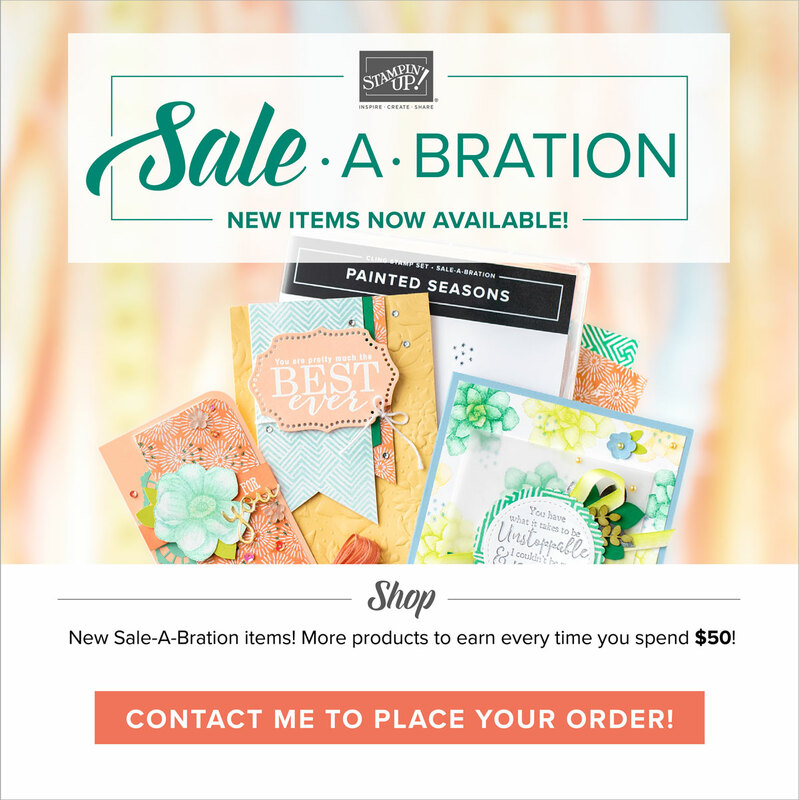 I've chosen to make some cards using the beautiful new Eastern Beauty Bundle along with some of our new 2017-2018 In-Colors!! Mix and match any of the dies together. When die cutting, layer one die inside of another. 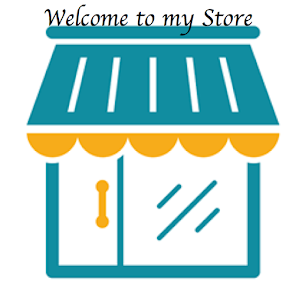 You will create a huge variety of your own beautiful designs. 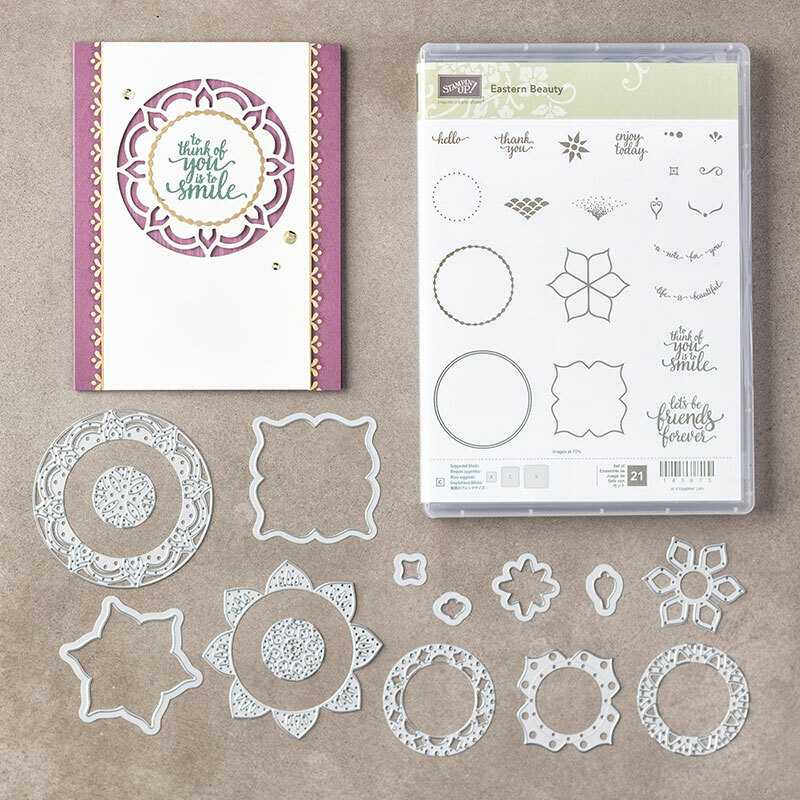 To "easily" add color, adhere a solid piece of colored card stock to the underside of the intricately die cut shape (see Lemon Lime Twist circle at the top of the card). 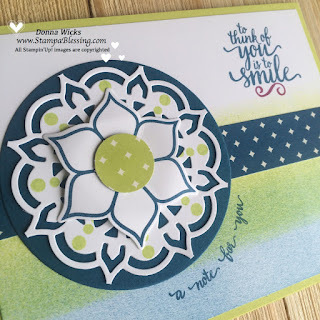 Glue your colored die cuts right on top of each other or pop some up with dimensionals. There is an abundance of fun possibilities with every thinlit. 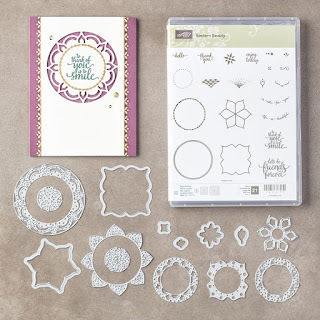 In the above card, I'd die cut the largest medallion and then used my paper snips to snip at each point, thereby freeing it from the card stock, and then glued it onto a Dapper Denim circle (Layering Circles Framelits). I used brayers to create the prettily inked bottom half of the card front. I love how crossing over the Lemon Lime Twist with the Dapper Denim gave me a green shade on the card! This beautiful card, on a Very Vanilla card base, was actually cased from "Lisa Curcio." I love those rich, regal colors used here, as well as the so-easy-to-use vinyl stickers (Eastern Gold vinyl stickers). The 1 3/8" squares were easily die cut with the Layering Squares framelits. This card comes together so quickly, is beautiful and can be used for many occasions. I store my thinlits on a magnetic sheet (Stamp-n-Storage). Those at the bottom are each grouped together with three separate thinlits which you can work with. Those can be mixed and matched between each other to create different looks, or, can be used individually on your project, just as they are. The first two pairs on the sheet are fun too. The outermost thinlits cut their shape out completely through your card stock. Those on the inside cut into your paper on the outer edges of the shapes, but there is no cutting edge on the inside edge of the thinlits so those shapes will not be released from your card stock. The effect looks like four and six "raised petals" on your card stock. I hope you will get to playing around with your own dies; have fun! I'm so glad you stopped by! Thank you, Jessica, "for having me!" Yayyyyyyyyyy, Donna! Congrats on being a Guest Designer :-D I love all these cards, hard to pick a favorite...but I have to say I didn't want to order those gold stickers at first, but I'm wanting to more and more now! I love how they can be used on a relatively simple card like your third one, and give such an elegant touch. Thanks for sharing this inspiration! Hello! So nice to see you! Thanks so much for stopping to check out my "debut blog post!!" and certainly for leaving your fun and kind comments!!! Those stickers surprised me; they really are plentiful and are super sturdy (thick) yet don't show much of a sticker-border as they are cut closely to the image. I am happy I gave them a try, honestly! Thanks for the love and hugs, K!! Hugs to you! It is indeed my joy Louise! She is such a talentd blessing!! So glad that you invited Donna as a guest stamper, Jessica! 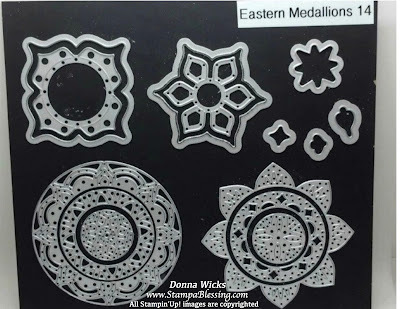 Donna, I just love your samples - I'll be 'casing' your 2nd one - love the brayer idea!! You're so talented, my friend. It's wonderful to see you showcased here. Thanks Deborah for leaving her your love. Donna is so deserving. She shines bright and warms the hearts of many! 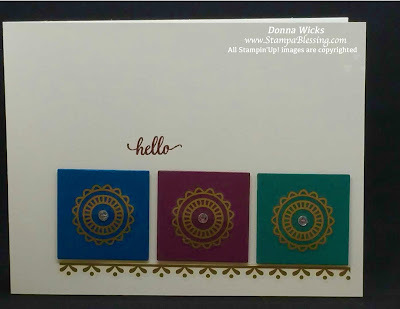 I love all of the fun ways you've used this suite, Donna! 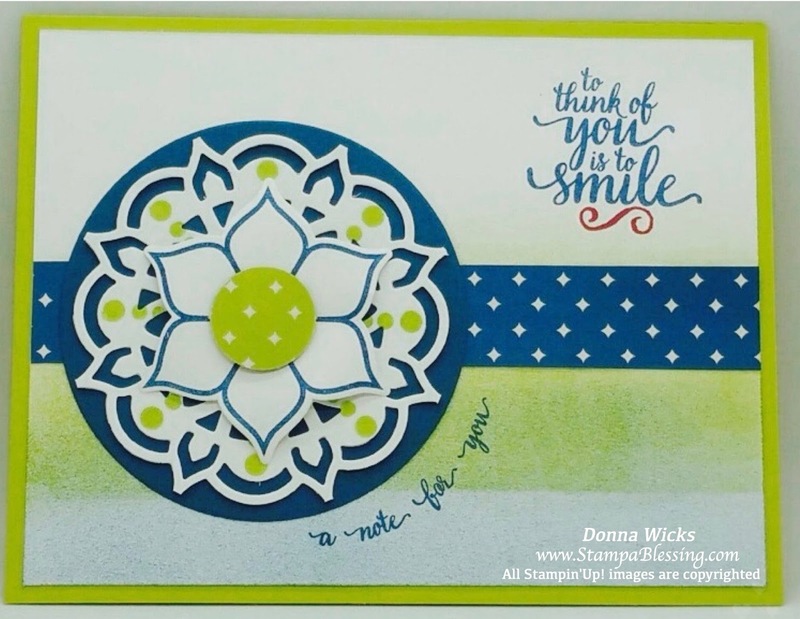 Thank you Jessica, for showcasing this sweet stamping friend! Thank you so much Amy! I'm so glad you stopped by and appreciate your kind words (Woot!)!! Cheers! Donna, I truly believe you are priceless. Thanks for sharing your many gifts with so many friends. You are so loved and admired by all. Thanks again. Thanks so much for stopping by and leaving sweet comments! It's fun to know which your favorite is, too! Thanks, Andrea! !